Native to the Rocky Mountains, the Colorado Blue Spruce is a very beautiful, very hardy tree that can grow in virtually any soil and does best when planted above 5,000 feet elevation. Useful as accent or screen, this is a massive tree that can reach 60 to 80 feet at maturity. It can grow at a rate of 8 to 10 inches per year. 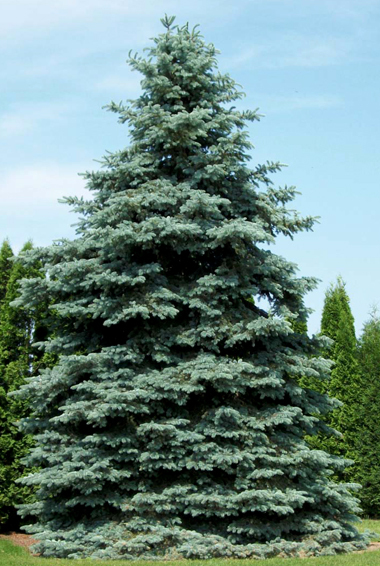 It has deeply grooved, grayish-brown bark and stout horizontal, tiered branches clothed by short, stiff needles ranging from blue-green to silvery blue create a dense, broad pyramidal conifer. Cones are light brown.